While getting dental braces is a very effective way to straighten misaligned teeth, the results often do not last a lifetime and the teeth can easily shift out of alignment. If you ever wore braces, then you certainly remember counting down the days until their removal. You might also remember running with excitement to your dentist’s office to celebrate this glorious day, just to find out that you are not fully in the clear. This is where dental retainers come in. When you visit your dental clinic to have your braces removed, your orthodontist will definitely want you to wear a retainer to stabilize the dental correction. You’ll likely find that you have a choice between wearing a removable retainer or a permanent one, also known as a lingual retainer. Here, we take a look at the latter. What is a Lingual Retainer? A permanent retainer does what dental retainers do – it prevents orthodontically treated teeth from moving back to their old, misaligned positions. But, unlike the removable or ‘temporary’ retainer, a lingual retainer is designed to stay on the teeth guarding against shifting 24 hours a day 7 days a week. This device typically consists of a thin metal band or wire (stainless steel) that runs across the back of your teeth (lower or upper). This wire is permanently attached behind the front teeth, using a cement formula very similar to the one applied to brackets of braces. This allows the wire to keep your teeth from moving right back to their original, incorrect positions. Retainers are also key in protecting the tissue that surrounds teeth that were recently moved into new positions. Current studies show that the majority of irregularities occur within the first 2 years of post-orthodontic teeth adjustment. It is usually made of stainless steel/metal alloy flexible wire. It is designed to fit on – and attach to – the back of the lower and upper front teeth. The wire is installed in such a way that it doesn’t show when you smile and even your friends won’t realize you’re wearing one. Your orthodontist attaches a fixed retainer to the back of the lower 6 front teeth and the back of the upper 4 front teeth immediately after you’ve had your braces removed. The permanent retainer device stays on your teeth indefinitely unless your dentist suggests removing it for oral hygiene or health reasons. 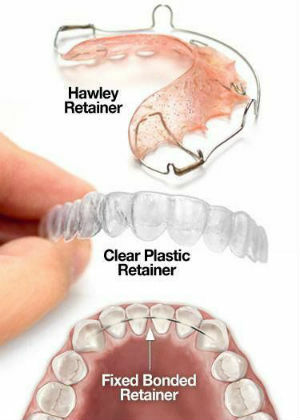 It is worth noting that regardless of its name, the permanent retainer does not need to be worn all the time. That’s right. Your dentist has the power and capacity to recommend removing the device and replacing it with a detachable type retainer at some point. This is usually done for a number of oral health reasons, such as damage to the retainer appliance, infections in the mouth, tartar buildup and pain in the mouth. As a matter of fact, as of late, many dentists use a combination of the two retainers as part of the orthodontic treatment. They usually place a fixed retainer that must be worn 24/7 for at least six months, then switch to a removable one that is worn only at night when going to sleep. 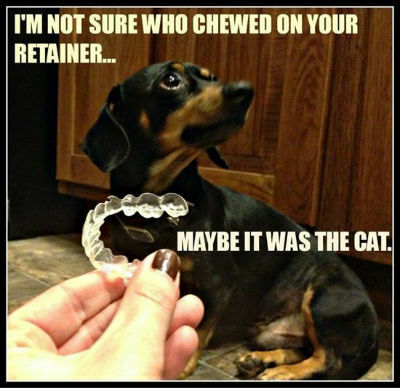 Alternatively, some dentists may recommend patients to use both types of retainers concurrently. When this happens, the patient will leave the dental office with a removable device to wear in conjunction with the permanent one. Some inconclusive research has demonstrated that because permanent retainers only help ‘retain’ the front teeth, wearing removable retainers in conjunction can offer the best protection against relapse for the entire set of teeth. While this certainly is an interesting point of view, the research is not widely supported. But, of course, you should expect to wear some form of dental retainer for pretty much the rest of your life. Your retainer – permanent or removable – ensures that your newly treated teeth won’t move back into their old misaligned positions. If you have worn a fixed device for a long time, you may be able to switch to a removable one that you can wear only a few nights per week. But if you decide to completely stop wearing a retainer, you could see your teeth move back to their original crooked positions. Like any other orthodontic appliance, the fixed retainer comes with both advantages and disadvantages. And naturally, you need to weigh both of them before opting in for such a dental device. Research has shown that a permanent retainer tends to do a better job of retaining teeth compared to removable type retainers. It is because of this that dentists recommend this type of device in cases involving severe misalignment issues that have a higher risk of relapse after orthodontic treatment. It offers a better long-term solution for straightening teeth, particularly given the fact that teeth begin to shift naturally as we age. It offers the convenience of not having to wear and remove the device now and then since it’s attached permanently. Because the retainer is permanently fused to the teeth, you don’t have to worry about losing it or forgetting to put it in. 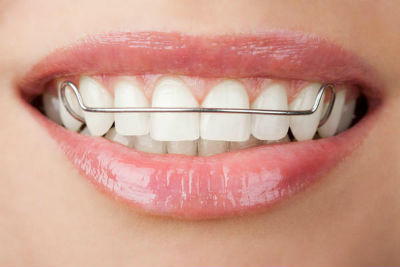 It combines nicely with other orthodontic appliances and products, such as night guards or sleep apnea devices. It attaches to the back of the teeth, and so it remains hidden from view. You can smile all you want, nobody will be able to tell that you are wearing a dental device in your mouth. The permanent retainer will remain attached to your teeth throughout the entire treatment. This can cause not only inconvenience but discomfort as well. In comparison, a removable retainer tends to be more patient-friendly in that it is worn at night and taken off in the morning, and you can also take it off when before meals or when you want to floss and brush your teeth. Flossing and brushing are more difficult because the retainer is attached to the front teeth at all times. Of course, your dentist will teach you how to do these standard oral hygiene tasks and give you the tools to complete them quickly and efficiently; but you’ll still find that it takes more time and effort to go through your daily oral care routine. Permanent retainers support the front teeth and, therefore, don’t provide much protection from relapse for the back teeth. The metal wire may cause irritation in the mouth, but this problem can be rectified through the use of dental wax. Permanent retainers come with the increased risk of plaque buildup, cavities and gum disease, since the wire is permanently attached to the teeth and you cannot remove it to floss and brush. Because of this, you should make sure you take the time to do teeth cleaning properly. Here’s how you do it: Start with an anti-gingivitis or anti-plaque mouth rinse. Start with an anti-gingivitis or anti-plaque mouth rinse. Make sure you do tongue scraping before you floss and brush in the morning. Brush – Consider using a combination of electric brush and ionic brush to clean your teeth thoroughly. Floss – Use a threaded floss or Super Floss to get into all those small spaces between ‘retained’ teeth. Lastly, don’t forget to ask your dentist about the best daily dental care routine for you. Juan Pierre loves his Permanente retainer !